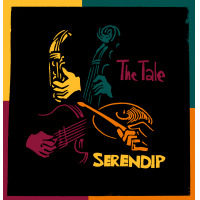 The group Serendip has a common jazz ensemble format: saxophone/guitar/bass/drums. But the music they make is anything but common. With The Talemusic that takes its inspiration from the ancient Persian story The Three Princes of SerendipBelgian-born and now London-based tenor saxophonist Arnaud Guichard has sculpted a compelling spiritual narrative for his quartet. The disc begins with a trio of tunes entitled "Prince One," "Prince Two" and "Prince Three." The sounds begin with a roaming, placid atmosphere featuring minimalist and egalitarian instrumental input. Guichard's sax bursts forth with robust blowing as a loose groove establishes itself. "Prince Two" brings in a tighter groove laid down by drummer Jake Long and bassist Michele Montolli , a distinctive and implacable momentum underpinning subtle and beautiful chords from guitarist James Kitchman. "Prince Three" holds the groove mode, with Arnaud warbling before he breaks out in full-throated blowing. Those three Princes set up a sort of mystic jazz mood, but it is "The Pregnant Lady" that proves the loveliest most mysterious offering on the set, via the judicious addition of electronic effects to the intricate group sound. "The Camel Owner" takes the music into near straight-ahead jazz territory, with a Middle Eastern tinge. And "Lonesome"again, with some terrific electronics addedunrolls like a surreal dream, with Guichard sounding a bit like saxophonist Ben Webster immersed in a mild and relaxing hallucinogenic experience. The Tale, the debut by Arnuad Guichard's Serendip, pushes the standard jazz quartet sound into fresh territory on a fine and engrossing debut. Track Listing: Prince One; Prince Two; Prince Three; The Pregnant Lady; The Camel Owner; Lonesome; The King; Serendipity. Personnel: Arnaud Guichard: tenor saxophone; James Kitchman: guitar; Michele Montolli: bass; Jake Long: drums.